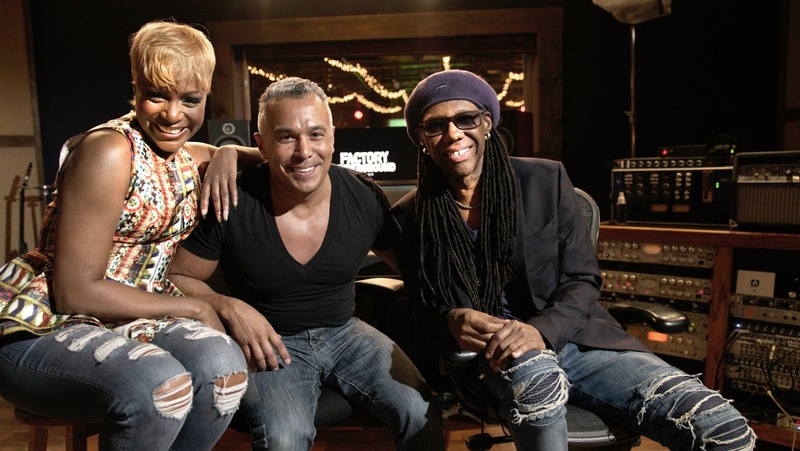 “My Fire,” the current #1 on the Billboard Dance Club Songs chart is a collaboration between Grammy nominated producer/DJ Tony Moran, incomparable jack-of-all-musical trades and Rock and Roll Hall of fame inductee Nile Rodgers, and the immensely gifted Kimberly Davis, vocalist for Rodgers’ legendary disco/funk band Chic. Or as Kimberly stated “No sane music artist would deny Nile being a part of their project.” Considering his resume, it’s impossible to disagree. Besides co-founding Chic with the late Bernard Edwards in 1976, Nile Rodgers has written, played on, or produced recordings covering everyone from Diana Ross, Luther Vandross, The Honeydrippers, Kool & the Gang, Madonna, Lady Gaga, and on and on. David Bowie’s Let’s Dance album; produced by Nile Rodgers. Duran Duran’s Notorious; Nile Rodgers production. This year Rodgers was inducted into the Rock and Roll Hall of Fame (Award for Musical Excellency), as a solo artist and not with the band where his early success was found. The omission was not lost on Rodgers. Explosive is a word used to describe the vocals of Kimberly Davis. She’s hit the Top Ten twice before, but “My Fire” marks her first song to hit the #1 spot. Onstage recently talked to the three friends and collaborators about their hit song and electrifying new video. Nile and Tony, you two are old hats when it comes to having a #1 song, but Kim, this is your first #1. Not just another day at the office for sure, so how does it feel? Nile: It’s great. Great, great, great, great. I’ve had lots of #1 records, but when you do it with special people, when you do it with friends that you love for a long time, people that you respect, it changes the vibe. It’s not just having a #1 record, it’s like you’ve completed some sort of important artistic mission. Kim: It’s awesome. Like Nile said, we’ve known each other for years now so we’re a musical family. It’s different when you have someone that’s like a musical family member. It’s a totally different vibe, it’s like everybody can say it’s only right that you guys collaborated. But timing is everything. It could have happened five years ago but it wasn’t supposed to happen five years ago. It was supposed to happen now. The whole thing with us and Tony and everybody together. The Mike Greenleys, the Audrey Martells, it was supposed to happen when it did which makes it even better. Tony: To be honored this time around for me, I feel like a 16 year old, actually a 19 year old, I didn’t have a #1 until I was 21. On this album, Moodswings, we’ve had six consecutive #1 singles.We’re working on a new single for Kimberly right now. I made Moodswings and I did it to be more of a producer’s showcase album. For the most part you’re under a certain level of restriction when you’re working with a record company that has goals for what they want to do for you marketing wise and everything. In this case it wasn’t a luxury, I just wanted to provide the opportunity to be able to learn about how I want to expand musically. Also, I live for the art of the collaboration. It’s so wonderful in this situation, where Nile and Kimberly got involved. Tony, you and Kim have worked on other songs together. How did the collaboration on “My Fire” come about? Tony: I had already written a song with a friend and a writer named Mike Greenly and another gifted writer named Audrey Martells. And we cut the song for Kimberly and we were very proud of what we had done. Then when Kim shared it with Nile and he asked if he could participate, what was so fascinating is it was like going in The Wizard of Oz and the twister. It was such an amazing feeling, and once Nile had laid down what became the new foundation for the song, then it was absolutely natural to rework everything, so everyone had purpose in the track. The song now had a very specific identity through what we all put into it. Nile, Congrats on your induction into the R&R HOF. In talking about your selection and not that of Chic, I found your comments on how there should be an even playing field as a basis for induction. You gave the Baseball HOF analogy as a great example. How do you even begin to change the nomination process into something where the voting is less subjective? Nile: There are examples that exist in the real world that have come before that and to me when I look at this and I look at my career, I’ve been doing this a very long time, there were picks that were poll centered. Readers and critics polls, that type of thing where I understand that. I understand people who believe that they inherently have knowledge that’s greater than the public and therefor their vote has a different kind of resonance. I get that. I call it elitism, but at a certain point in time I actually think it’s right. If you’re a musician, you understand the nuances of what a person put into a recording, where the average Joe Blow on the street just doesn’t. It makes them feel good, but It’s a different kind of reaction. A primal one as opposed to an intellectual reaction. There are different ways of judging and I’m totally fine with that. When I joined the record business there was no Rock and Roll Hall of Fame. It didn’t exist. To me, what was my rock and roll hall of fame was every couple of weeks when they said ‘Mr. Rodgers, there’s a whole bunch of Gold and Platinum records to hang in your office, whatcha want us to do with them?’ That was my rock and roll hall of fame. I make records for the people. We all do. If we make records for ourselves, let’s be honest, we could just do this at home and listen to it ourselves. But unfortunately the only criteria by which we can be judged is in the public eye. There are different gatekeepers that control that and we have to swim through that current, and just hope that we land in the right place. In our hearts we do it because we love it. The accolades and gifts and all the other stuff that comes along with it, that is totally icing on the cake. It gives us an opportunity to walk into a room full of our peers one night, and make a couple of jokes with all that kind of stuff, and after that’s over, we go right back to the grind. Tony, you’ve been nominated twice for a Grammy award. No doubt “My Fire” could be a strong contender for a nomination. What are your feelings on a possible Grammy nomination? Tony: In the dance category, there are like nine categories or ten categories within that. We’ve gone in to put in the submission for it and as Nile put it, there are a lot of gatekeepers out there and I’m just hoping, as I’ve been nominated before. I believe so much in the work that I did. I think this has a lot of unique energy in it. My hopes would be for it to continue to be recognized on different levels, but we are still in the midst of allowing it to grow. Putting the seeds where we need to. Let other people get to know it and understand it. If that happens, it’s great and Kimberly absolutely deserves it. And Nile needs to give me the key to his house to move some Grammys over and move some Gold records over and make some space. I won’t put anything in the closet, I’ll just organize a little bit. There’s always room for more. Kim, the video is so upbeat and there is so much joy in your face throughout the song. Tell me about the effect of the song’s power on your interpretation. Kim: I’m happy all the time and with me doing what I like to do, that is always going to come through. Tony is like my musical bestie so him being there for support was just awesome. I can interpret a song easily if I love it, and this song, the minute I heard it, it was like, this is the one for you. Who knew that it would get to where it is now? I’ve gone into the studio and sang songs where with some of them I wasn’t feeling it, but I sang them. But if I like it, it’s going to always have more enthusiasm than anything else. Tony: To be honest, I was kind of blown away when we did the video. Everything that Kimberly just said is so true. When she goes in and feels a song, she just sings it and she feels it. You don’t want to interrupt her when she’s trying to get to know it because that’s part of the magic. When she went to visually interpret it in the video, she was so into it, she was so animated, she was so fabulous. 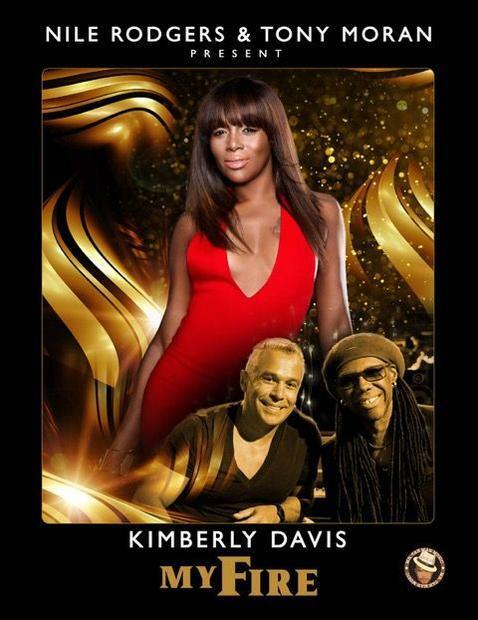 Kim, Chic is slated to play a double bill with Earth, Wind & Fire at Madison Square Garden on August 7th. Playing the Garden is a milestone for so many musicians I’ve talked to. What are both of your expectations as Chic plays there for the first time? Kim: Chic’s music is really popular overseas. We are just getting our American audience onboard. We’ve done the Duran Duran tour, we’re going to do the Lionel Richie tour. So we’re doing this now and it’s helping us cross over back into the States. We were doing gigs in the States and it was like…ok. Now it’s like…OK. We are trying to kick down that door. But the Garden is the biggest thing ever for Chic, period. It’s going to be awesome because Nile is promoting “My Fire” at every venue that he goes to. The sound guy is playing the song throughout the setup, changing of the stage, so it’s getting heard and he’s putting me on blast to let everyone know we have a #1 song out. So that’s a whole lot of publicity at the Garden. But the timing is everything. We could have done a song together, just me and Nile without Tony. That would have been the wrong time. We could have done the song and it wouldn’t have been with us being on tour to go to all these venues. For this song to be out at this particular time, for us to be on tour and to get out, we’re doing all these places that need to know about “My Fire” as well as Chic. So it’s timing. Timing and a whole lot of talent.